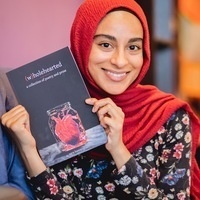 Join us for an evening with Sara Bawany, a social worker and a poet with a passion for bringing some of the most-taboo issues in South Asian and Muslim communities to light. A clinical social worker in the Dallas area, Sara recently published her first book of poetry. (w)holehearted touches on themes of identity, mental health, domestic violence, femininity, relationships, spirituality, forgiveness, and a variety of social justice issues. The Office of Religious and Spiritual Life in partnership with, Muslims and Allies, invites you to an evening of storytelling and discussion about the process of healing, unlearning shame, and creating a space to speaking deep truth. Individuals who would like to request accessibility accommodations should contact hosorto@ithaca.edu. We ask that requests be made as soon as possible to ensure they can be met.